Does it make sense to talk about a virtual printing museum in Johannesburg? Or anywhere else for that matter. By definition, virtual museums are nowhere. Or in the cloud (poetic version), or on a GAFAM server (much less poetic). In the present case, the museum is both virtual and very much somewhere, for the South African Virtual Printing Museum is an offshoot of an absolutely material operation called imPRESSed, a heritage workshop which offers letterpress printing and craft binding services as well as a programme of courses in bookbinding, book repair, printing, marbling, etc. 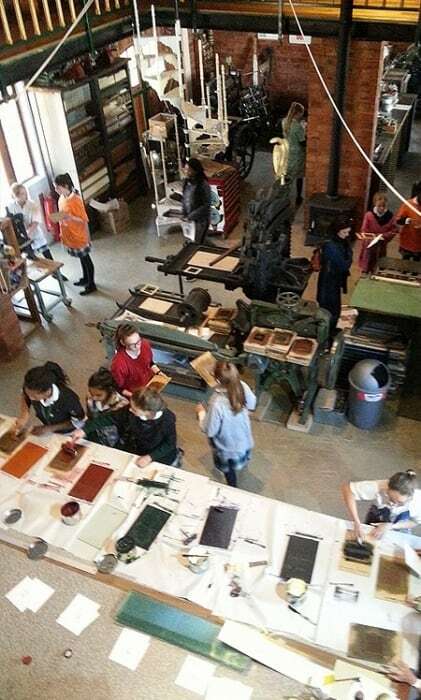 ImPRESSed – a member of the AEPM – was originally intended to be an early twentieth century jobbing letterpress and bookbinding workshop. And during its five years of existence it has accumulated a large collection of bookbinding and printing equipment, one of the biggest in South Africa. Many of the machines, tools and other items were in a bad way when they were recovered. But almost everything is now in fine working order. Today imPRESSed thinks of itself as the ‘custodian of ancient crafts and apparatus’, meaning that it is as much about preserving and sharing as it is about printing and binding. But even in the quiet world of letterpress time passes quickly and innovation never stops, with the result that imPRESSed has just revamped it’s web site after only three years of faithful service. The previous web site was stylish but less dynamic than is generally expected today. Of particular note in the new version of their website is the Virtual Printing Museum which allows you to visit the imPRESSed workshop and learn about the machines and techniques which it uses. It is still in a more or less prototype stage and so can be a bit ropey at times (it’s a lot easier to handle with a mouse rather than with a touch pad, for exampe) and will continue to settle down and fill up with information in the weeks to come. But it is well worth the visit and might give more than one printing museum or heritage workshop a few ideas. And it is interesting to note that imPRESSed’s virtual printing museum was born at least partly out of necessity. For imPRESSed is located in a leafy Johannesburg suburb with a thousand local town planning by-laws which make it rather difficult to open freely to the general public as a normal workshop/museum would. The virtual museum will certainly be one way of making this constantly growing heritage collection better known.